Quality Outdoor Cushions- Frequently Asked Questions - Great ideas for enjoying your patio space. One of the nice things about owning a business for 10 years and dealing with the same manufacturers, is you really start to see first hand the quality of the items you sell. In this blog, we are going to discuss Outdoor Cushions. 1) What makes an outdoor cushion- a quality cushion? Outdoor cushions should have several components that make them quality. First you must have a quality foam core for seat cushions. This core should be made of foam that is dense in nature. 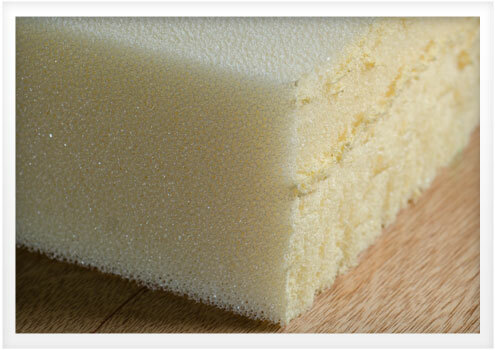 An open cell reticulated foam has open pores that allow water and air to flow through easily. Open Cell foams make a comfortable and cool seating cushion or mattress. Dry Fast is a high quality open cell foam. Dry Fast foam is formulated with an antimicrobial agent to prevent mold and mildew. It is a more expensive foam, but you get what you pay for. When paired with an outdoor cushion fabric open cell foam creates a virtually maintenance free cushion in sun, rain, and snow. Life Expectancy 5 to 8 years. For Back cushions, you will want quality polyester fiberfill. For most of the higher end manufacturers you see that they package back cushions in it own separate pillow so the covers can be taken off and washed. Some less expensive cushions use regular foam outside. The problem with using regular foam-is water tends to sit and mold out the cushions. This is not a bad option for cushions that are not in humid climates and cushions that are not out in full sun. 2) Are there differences in Outdoor Fabrics? Solution dyed Acrylic are the best fabrics to be used outside. They commonly go by the brand names Sunbrella, Outdura and Tempotest. Each fiber is dyed before it is woven into a fabric. Even in the brightest sun, solution dyed Acrylic fabric offers years of carefree service. Hours in full sun- approx 2000. Less Expensive - 100% Spun Poly. These fabrics are printed on one side. Hours in full sun- approx 300 to 800. Also we suggest when shopping for outdoor cushion try to check the foam- we have seen a lot of less expensive cushions carry the Sunbrella name on the cushion but have a cheap foam on the inside. A true quality cushion will have the above elements.